See Xenon Labs Currency Converter for current exchange rates. Produced from 1982 - 1990, the 40 Aft Cabin was a big seller for Silverton. With a solid fiberglass hull, she has easily outlasted many of the cored hull designs that followed, and her wide, 14' beam adds great stability when the going gets rough. The interior layout is roomy with wrap-around windows for great natural lighting and visibility, and rich, teak cabinetry throughout. Both heads have separate shower stalls and the stepped-down galley is well equipped with full-size fridge/freezer, stove and oven. 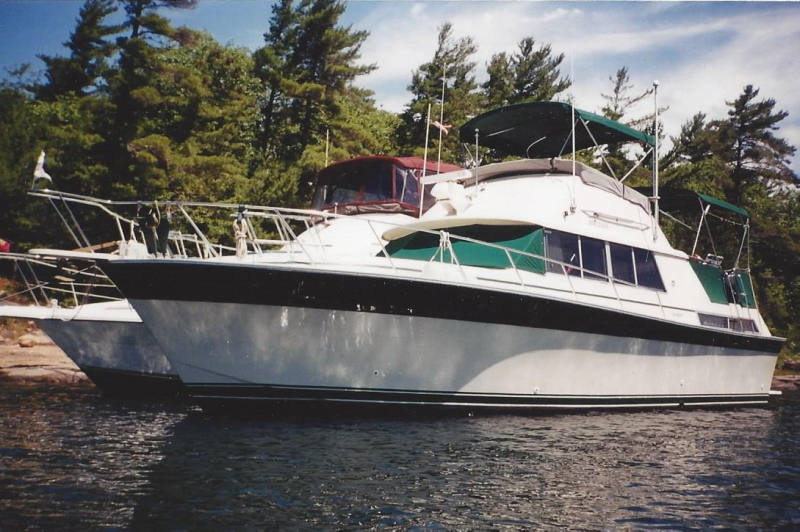 This Great Lakes freshwater cruiser has seen only three owners and has been very well maintained since 1997 by her current owner. She comes with a meticulous service log and a paid-up slip at one of the finest full-service marinas on Southern Georgian Bay. A "must see" for anyone searching for a solid, reliable, aft cabin with a full suite of cruising comforts. Specifications are believed to be correct, but are subject to errors, ommissions and/or change without notice.